Representing the dreams of 250,000 children, and showcasing one of the finest fruits of Colombia's El Sistema-based, youth orchestra initiative, the Filarmónica Joven de Colombia (FJC) made its North American debut Friday night, in Miami Beach. 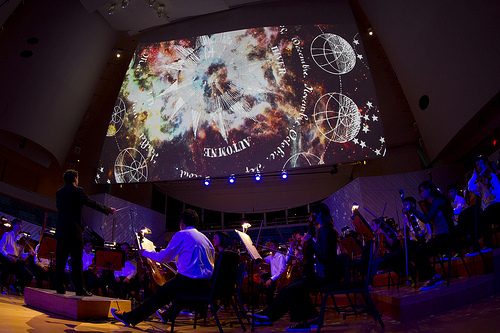 Before a packed house of supporters, FJC's 108 young musicians played a demanding program of colorful orchestral showpieces at a gala concert in Miami's New World Center, that showed where the future of classical music lies. Encouraged by Alejandro Posada on the podium to follow their hearts as long as they played most of the notes, FJP pounced on Cristobal Halffter's fantastic Tiento del Primer Tono y Batalla Imperial(1986) with exciting clarity and explosive virtuosity. When four young trumpeters played the work's martial fanfares, the conflict and glory of Colombia's shared legacy with imperial and colonial Spain echoed through the hall. Next, Eduardo Rojas played Rachmaninoff's Second Piano Concerto as a tumultuous, majestic symphony for piano and orchestra. Rojas and his massive technique collaborated with the young musicians at times on an intimate scale, finding poetry in lingering legato phrases and lovely woodwind colors and, at other times, surging to the music's iconic Romantic outbursts. Rojas began a theme that continued through the night with his dazzling encore based on the popular Colombian song "La Gata Golosa." After intermission, a hip, young production team enhanced a richly electric performance of Stravinsky's Firebird Suite with a light show, and a sumptuous performance of Respighi's Pines of Rome with quirky, closely aligned if non-contiguous projections on a large, high screen. Two encores based on popular songs, "Kalamarí" and "Colombia Tierra Querida," had the audience dancing in the aisles, and musicians donning Colombian national soccer jerseys. In Frank Gehry's audiophile hall, the Filarmónica Joven de Colombia connected immediately with the wonderfully receptive, enthusiastic crowd. Whenever it seemed appropriate to applaud, there was always a moment's hesitation before the audience decided whether to shout, laugh or cry. Usually they did all three in an outburst of love for the music, the musicians and Colombia. For the musicians themselves (who had begun nearly a year ago, rehearsing in groups scattered across the country before gathering in Cartagena in January for their first rehearsal together) it signaled a process through which they had begun as boys and girls, and had now become women and men, and for more than 20 percent, professional musicians. In Colombia, as in Venezuela, the core of the idea that has ignited such energy, enthusiasm and commitment is a national youth orchestra program that creates a way of life for its participants and is intended for all. The Batuta (Spanish for the conductor's baton) National Foundation for Youth and Children Symphonic Orchestras, created in 1991, now supports 284 orchestral centers in 106 cities. Modeled on and adapted collaboratively alongside Gustavo Dudamel's El Sistema, in Venezuela, Batuta is reportedly the second largest youth orchestra system in Latin America. There are lots of national youth orchestras these days. 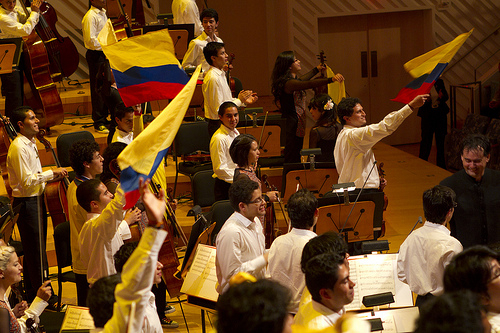 Venezuela's youth orchestras propelled Dudamel into the big time. 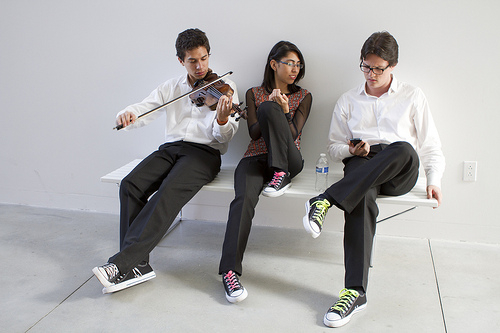 The National Youth Orchestra of the United States of America, launched a few weeks ago and a project of cultural conglomerate Carnegie Hall, has reached London's Royal Albert Hall on its debut tour of prestigious culture palaces at home and abroad, wearing red pants, blue blazers and Converse All-Star tennis shoes. For the Filarmónica Joven de Colombia, attired in disarmingly simple white tops and dark pants for the men, simple, elegant dresses for the women and, for both, retro sneakers with neon laces, after touring Bogotá and five other Colombian cities, Miami was the culminating event. And none of the young musicians can tell stories more compelling than FJC's harpist who can't afford his own harp; even if he were able to raise the $15,000 a harp costs, he would rather use it to buy a house for his family. It's not only the 20 percent of the Filarmónica Joven de Colombia who become professional musicians that demonstrate that investing in the arts is sound economic policy. It's the 80 percent who will become teachers and audience, who discover ways of life and ways of making a living and self-esteem that go beyond what we, in the States, commonly experience in the transactions going on in outreach. The impact of the 250,000 participants who have passed through Batuta will be immense. 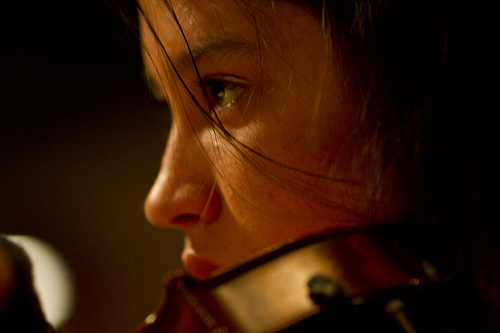 Now that the El Sistema universe has gained a firm footing in North America, Colombia can also begin to offer its own experience, innovations and humanity directly to the American adaptations, providing a common musical experience with which to communicate across linguistic and cultural gaps. In Dallas and Fort Worth, Eduardo Rojas will be soon heading the El Sistema implementation. Dudamel, whose relationship with Bogotá, and throughout Colombia, is very close, could secure FJC's fortune if he conducted them on a North American tour. By endorsing Colombia's vision and investment, such a tour would accelerate the process of putting Colombia on the map as a builder of classical music bridges, and fuel Batuta and the Filarmónica Joven de Colombia's growth, stability and instrument banks. Speaking of soccer jerseys, in March, bitter rival Venezuela defeated Colombia in soccer, one to zero. The Filarmonica Joven de Colombia is good enough right now to challenge Venezuela's best in a classical music youth orchestra duel and regain their country's honor. Better get those FJC jerseys ready!